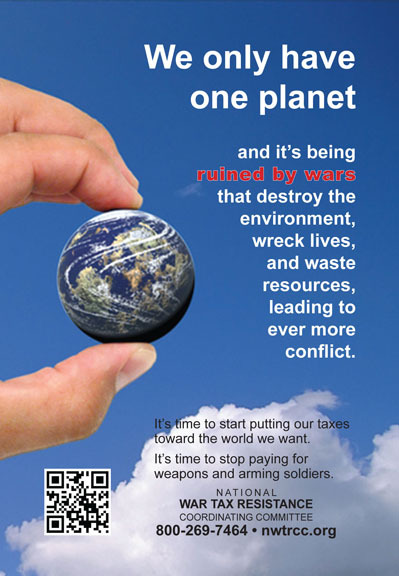 See our tax day chants page, where you can also read the lyrics and see the flash mob created by Berkeley, California, Bay Peace activists. Take these ideas and develop your own creative action! 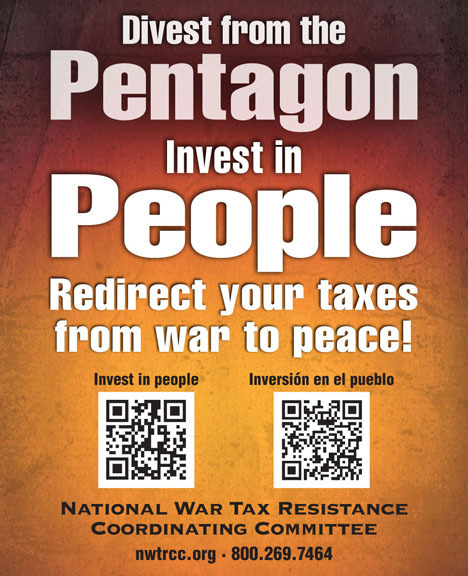 If you think more people should know about war tax resistance, we welcome your ideas and help. 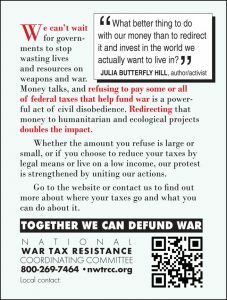 NWTRCC is a resource center connecting the individuals and groups who support and do war tax resistance. Volunteers do most of our organizing work, and the best outreach is done in your own networks in your own community. Let us know what you are doing so we can share your ideas with others! Have a clear date and time. Plan to devote at least a few hours to active promotion of the event beforehand: compose a press release and e-mail it to local news outlets, email an announcement to major email lists, post it on Facebook, personally contact people in other groups, congregations, etc. and ask them to forward it to their communities, go to other events with flyers to promote yours, etc. Contact local media in advance and on the day of the event. 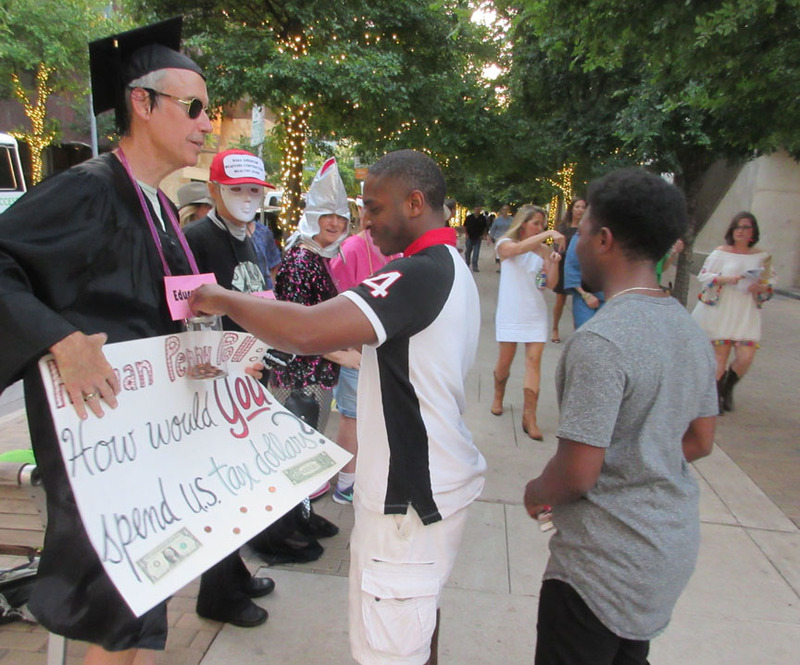 Have plenty of leaflets or flyers available for passersby, even if the focus of your event is more active, like an action at the IRS or a public official’s office, or street theater, or a public redirection of taxes. Consider having separate material for youth. Make placards for the event for yourself & others who might show up. Prepare for minor outside interference, such as dogs barking, babies crying, police sirens, etc. Take photos and videos to send to NWTRCC and post on social media. Having a photo-op you can use for publicity for future events is important! If you’re doing street theater or some other type of performance, have a vision for how the performance will engage the public. Have an option for audience participation! Don’t be discouraged if your event doesn’t have a large turnout. It only takes 1 person to speak at a rally or hand out flyers. In Portland, OR, each Tax Day, a small group of volunteers holds signs on the bridges to raise awareness. Small actions still have results. 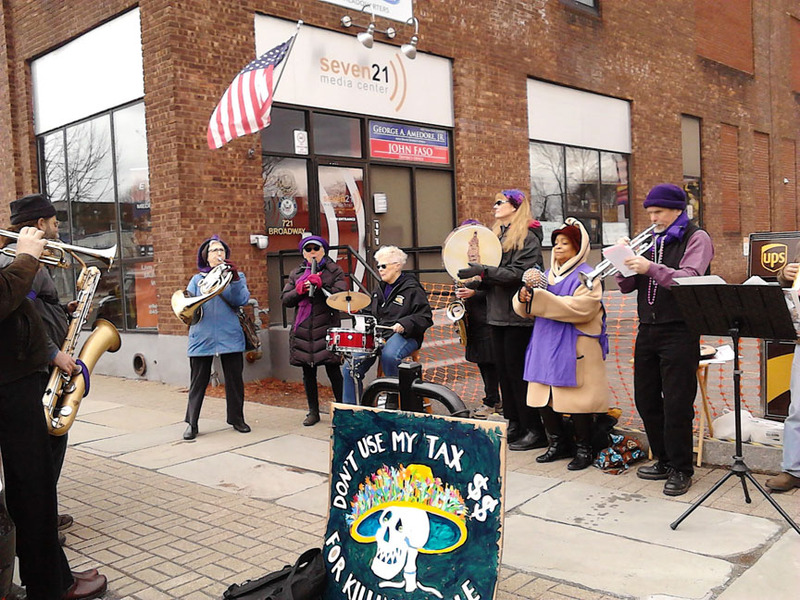 Daniel Woodham reports: “A noontime event was held on tax day outside of Congressman John Faso’s Kingston office at 721 Broadway in Kingston. 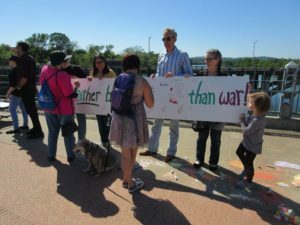 Approximately 40 people braved the cool, breezy and slightly damp sidewalk telling Congressman Faso’s environs that people want to “Cut War Spending and Fund Human Needs”. With a focus on paying taxes for peace instead of war, songs with traditional as well as alternative lyrics were sung. Members of Rise Up Hudson Valley, Citizen Action Kingston, and musicians from Tin Horn Uprising joined others that came in support to sing songs such as Wade in the Water, Get Up Stand Up and We Shall Overcome. People followed along on song sheets while 8 Tin Horn Uprising activist street band members played the musical interludes. With signs such as “Half of Federal Tax $ Pays for War Making”, “Invest in Kids not War” and “Make America Kind Again”, the lunch time of serious singing ended on a sweet note. 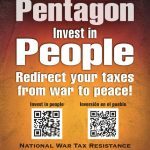 Well sort of… Copies of War Resisters League “Pie Chart” were distributed showing that almost 1/2 our federal tax dollar pay for war. So the gathered crowd got to share in the Apple Pie from which each person got a VERY SMALL piece while the Pentagon got the vast lion’s share. And though the staff at Congressman Faso’s office declined accepting our “gift” of the 1/2 Pie (Pentagon’s Slice), we were able to pass along a few pie charts and ask that next time the Congressman NOT vote for an additional $70 billion in defense authorizations that were not event requested. Instead of sending more tomahawk missiles at a cost of $1.4 million each to threaten global warfare, as we did with 66 such missiles in Syria last Friday, we would rather have that money be spent to better our schools, health care system and housing and job programs for Americans that need help. 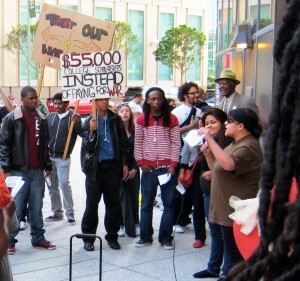 Activists and resisters held a press conference at noon on Friday, April 15. 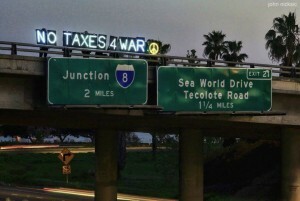 War tax resisters and peace activists also caught the attention of highway commuters with the Overpass Light Brigade on the evening of April 15. Many of these ideas were written with April’s tax day in mind, because that is a day when the media is focused on the issue. But the government is taking taxes year-round from your paycheck, so don’t wait until April to get out and demand that our money be used for people and the planet and not war. You don’t need huge numbers of people to have a visible presence at the post office as people pay their taxes. Some of these creative ideas used on tax day can be used at any time, as our struggle goes on year-round. Download or order free flyers. Check out the Flyers page on our website for materials that you can download for tables and leafleting. See the Environment, Taxes and War page for links to resources, including our free “earth cards” shown below and on that page. These different palm cards are free from the NWTRCC office (we’re always happy for donations with your order). Click on the images to the right to read each card. Contact us to find out what’s currently available! 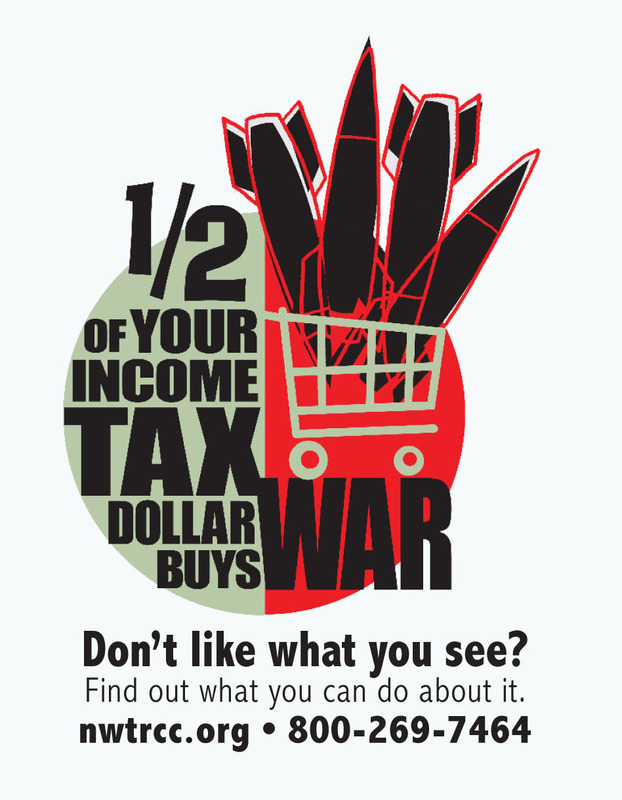 Leaflet with the WRL pie chart “Where you income tax money really goes,” with its breakdown of military spending — the government’s deceptive figures, as well as how the dollars are really spent. This includes a list that compares the costs of tools for war and tools for peace. Order copies from our Publications page, or download a copy from the War Resisters League website. March from place to place that is losing funding and end your march at the Military Recruiting Office (the government spends billions of dollars each year on recruiting). Use props or costumes to gain attention. Focusing on war profiteers and how tax dollars pay for huge corporate profits makes for great street theatre. Make a fake mailbox where people can send their taxes directly to corporations like Lockheed Martin, Raytheon, Halliburton, etc. 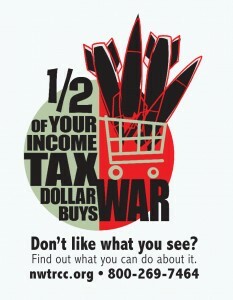 Hold a “Bypass the middleman, send your taxes directly to the corporations who profit from war” sign. 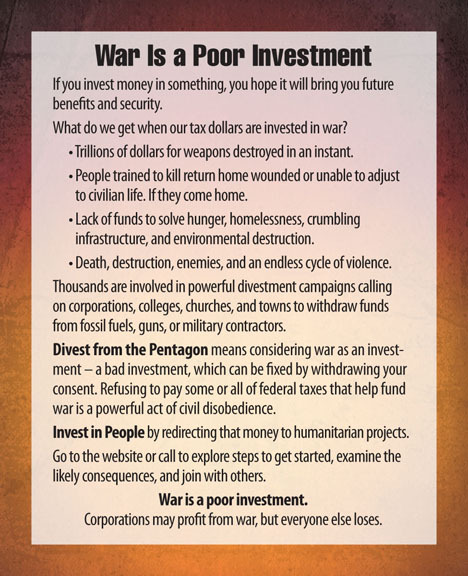 Find more information on war profiteers on the CorpWatch website. Use puppets of mothers and babies, or large pictures of victims of war with a sign “How your tax dollars are spent”. Make drone models with $40 million price tags (see KnowDrones). 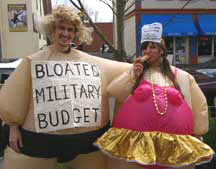 Make long banners that read “Military Budget = Death and Destruction.” Have a mock funeral, make coffins. Conduct a die-in (legally or as civil disobedience), showing what happens when these weapons bought with tax dollars are used. Make dead “babies” by stuffing clothes or use wrapped blankets. Draw outlines of the dead with chalk so the image remains after the body is gone. Burn tax forms. This can be done as part of a blockade or in a visible, legal site. In conjunction with burning tax forms, have a banner with the Daniel Berrigan quote “Pardon us, friends, for the fracture of good order, for burning paper instead of babies.” Fr. Berrigan wrote this explaining his role in burning Selective Service (military draft) files in Catonsville, Maryland, during the Vietnam War. Offer apologies for burning tax forms instead of Iraqi cities, Colombian villages, Palestinian schools, Afghan hospitals, etc. Conduct a penny poll and publicize the results in a press release or letter to the editor of your local paper. Have a bake sale using the theme “It will be a great day when our schools get all the money they need and the navy has to hold a bake sale to buy a battleship!” Remind people that the hundreds of cruise missiles being launched from navy ships cost $1 million each. Folks in Des Moines do this bake sale every year, giving the proceeds to the under-funded alternative high school. Turn the federal budget pie-chart into a large poster. Hold a few large banners rather than lots of small ones that are hard to read as people rush by. Give out pie with your pie charts — pieces of pizza pie or dessert pie. You can add a little theatre by having a “representative” of the Pentagon “eating” most of the pie when others get only tiny slices. Candlelight vigil with a large banner saying, for instance, “Taxes for Peace Not War” in front of the Post Office, a military contractor, or in another appropriate place. Go to a budget hearing at the local City Council or Board of Education to talk about the federal budget. Do a penny poll beforehand and announce the results. School budgets and human services are being cut while military spending grows. Use the local media. It’s a good way to get your message out! Write a letter to the editor or call a local talk radio show to talk about the way you’d like to see your tax dollars spent. Let them know that your demonstration will include a “photo opportunity” such as the penny poll, costumes, and the like. 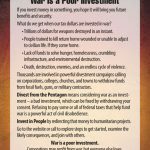 Originally written by Joanne Sheehan, War Resisters League/New England, wrlne@peoplepc.com. 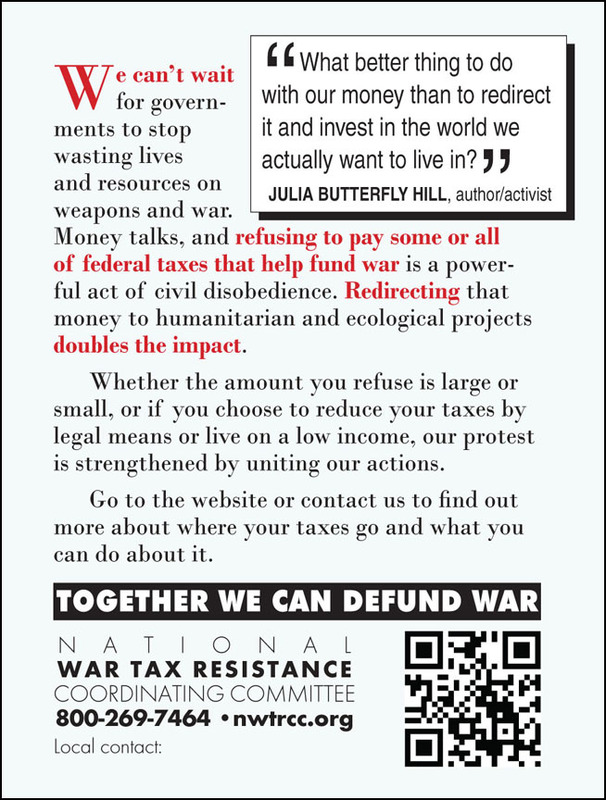 Along with NWTRCC, the War Resisters League has many resources on war tax resistance and war resistance. Help us promote our work by downloading these PDF ad sheets and by printing one of the ads in your newsletter or publication. Exchange ads welcome; please contact the NWTRCC office for details. Please copy one of these buttons and add a link to nwtrcc.org.